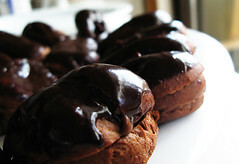 To make chocolate pastry cream, begin by boiling 1 cup milk in the microwave. In a heavy-bottomed saucepan, whisk together 2 large egg yolks, 3 tablespoons (38g) sugar, and 1-1/2 tablespoons cornstarch that has been sifted. Drizzle in the hot milk, whisking all the while. Place over medium heat and, whisking without stop, bring to a boil and continue to cook for 1-1/2 minutes. Whisk in 3-1/2 (100g) melted bittersweet chocolate until thoroughly combined, then take off the heat and scrape over a sieve into a small bowl set over ice water. When cool (about 60°C or 140°F), stir in 1 tbsp + 1 tsp (20g) unsalted butter in 2 additions. Cool completely and store in the refrigerator with a piece of plastic wrap pressed against the surface.